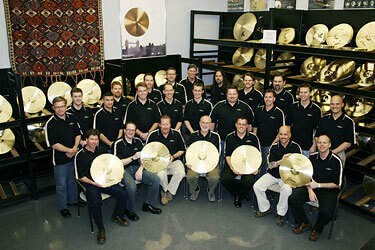 With the 2007 DCI season right around the corner, some of the best and brightest marching percussion writers, arrangers, and instructors recently visited the Zildjian factory for a day of learning and information-sharing. This was the fifth such "meeting of the minds" which is sponsored by the Norwell, Mass.-based Zildjian company every several years. Jeff Ausdemore (Blue Knights), Brent Montgomery (Blue Stars), Brian Stevens (Troopers), Mark Thurston (WGI percussion coordinator).